Barry's Educational Leadership program is student-centered and prepares you to become an outstanding leader in public and non-public educational institutions. The Educational Leadership program reflects the latest issues and knowledge in education and is responsive to the needs of a diverse student population. Faculty draw upon their own professional experiences as former administrators as well as your life experiences to facilitate mutual professional and personal growth to promote meaningful change. The ability to be proactive and decisive with a moral and ethical commitment to the organization's mission. The cognitive and communication skills necessary to facilitate meaningful change. Flexibility in using decision making and motivational strategies for effective stewardship of time, resources and personnel. Barry's Educational Leadership program is state approved. Upon completion of your degree, you will have eligibility for the Florida Professional Educators' Certificate. 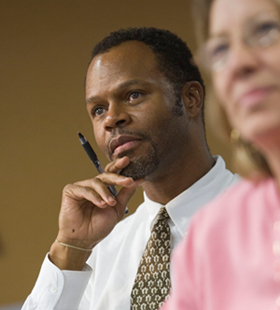 An Education Leadership degree from Barry reaches beyond gaining your Florida certification. Your degree is transferrable to all states. You can move virtually anywhere with a valuable credential that will support you in a lifetime involvement in leadership and education. Barry's curriculum is designed to move you quickly into the next stage of your career. You can complete the 36 credits in 6 semesters and be eligible in the next school year for a promotion. All courses are offered in the evening. Most courses meet once a week for sixteen weeks. Summer courses meet in a ten or twelve week format. Barry is dedicated to providing an excellent and accessible education. We offer qualified educators a tuition discount. You may be eligible to receive financial assistance. For more information, please contact our Graduate Financial Aid Office.